With 60 years under their belt, Bill’s Sweeping Service in California shines like a diamond with three generations actively involved in the business. Bob and Deanna Carter purchased Bill’s Sweeping Service in 1962. With their sons Mark and Mike growing up at the company, the sons were well trained when Bob and Deanna retired 20 years ago. Recently, their grandson, Grayson Carter, joined as operations manager. Those procedures and trainings help to set Bill’s Sweeping apart. “We focus on safety, technology, systems and participations,” says Mark. Around 1980, Mark graduated from college and they began using a pre-IBM PC computer the Commodore PET. “We even had real-time GPS before cell phones,” he says. All office work stations have at least two monitors, even in the shop. “I have three,” says Mark. “Giselle Chapman, a frequent speaker at NPE quoted a study that dual monitors increased productivity by 35 percent. Sold! We also have large flat screens in our office, one showing traffic, the other our GPS system. Our operators can check weather and traffic from a shared computer before heading out. “One of the most exciting developments is a new sweeper specific software application called BirdDog Lead. Our operators are all beta testers, which keeps them interested and engaged. “Not all of our technology is computer based. Our shop has four independent lifts that can put the largest truck six feet in the air. If we were to start a new location, this is the first item we would purchase. The things you can see and do standing under a truck are so much more than from a creeper or in a pit. “Our rebuilding and customization program is run by Mike. We rebuild and update on a constant basis. Getting an older broom truck to sweep like a new one is pretty easy. Keeping them sweeping with hard-to-find parts is a challenge. Keep in mind we don’t suffer the rust issues as other parts of the country might. “While being leading edge in some areas is great, being ‘Old School’ has it’s benefits. There are only three things that touch the ground on a broom sweeper: rubber, poly and carbide (four if you count the gutter broom). This has not changed in 60 years. Delivering those three at the proper speed and pattern is all about the operator. “While our business model focuses on the simplicity of older machines and rebuilding, hats off to the manufactures of sweepers. We all get sticker shock but the processes, science, technology and regulations involved with building a sweeper now is unprecedented. not to say we have not all made hiring mistakes, but having a system to release them back to industry so they can be successful is important. 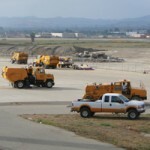 One of our hiring systems can be found at www.sweeperjobs.com. “While the web page and setup we use at sweeperjobs.com might be beyond in the in-house skill set of many contractors, we also use https://ziprecruiter.com/r/25f6ccfa. They can post a job to 40+ job boards with one click. Even better, they pull the info from resumes and give you tools to sort and manage the entire process. “The best systems run on autopilot, however they are always being tested and improved. “As you might have noticed we tend to share our systems. Either including some in an article like this or doing a seminar or webinar for NAPSA or National Pavement Expo. In fact our entire rate sheet is on our web page for all to see, including direct competitors. Perhaps a little crazy to give things away like that. However, we always get back so much more. The conversations we have with vendors, customers and fellow sweepers help us constantly evolve. “As most people know, our national sweeper trade association NAPSA was preceded by NCSA, NCSI and others,” says Mark. “We have been involved since the beginning in 1979. I have worked with every president since our first one Kerry Armstrong. Almost all have become great friends and a huge resource—and that is just the tip of the iceberg. All the board members and members over the years have so much information and experience. “In 35 years we have only missed one or two events. With each event there is time away from the office, plane tickets, hotels and registration. However, in all that time we have never once had an ROI that did not exceed the cost of the trip. We have to go now, because I know it will cost us money if we don’t. “The lobbying NAPSA-CA did in California with CARB, while not very successful, did result in some changes to the law. It also created some pretty good friendships with other contractors. “Being a Certified Sweeping Contractor (CSC) for 10 years has been a bonus as well. The private lunch at NPE allows us to have candid conversations with the leaders of our industry. It’s too bad we don’t have more CSC’s. It works in our marketing and we have had several no-bid opportunities as we were the only CSC in our market for a while. Even the smallest one truck contractor can be a CSC if they follow some basic BMPs, so its baffling why more don’t take advantage of it. It’s only $8.33 a month. “We also participate heavily in 1-800-SWEEPER. The key here like everything else: we participate! We save money on every program and get new customers. The ROI just works, but you have to use it. “The Sweeper Summit last November was unbelievable. During the first Sweeper Summit at the bench marking session, one member had significantly lower turnover. He was not paying any more in wages or had any special perks. It turns out he was using a not very well known pre-employment testing system to pre-determine success in the position. It works for him and now it’s working for us. To help meet one of California’s annual requirements of diesel trucks, Bill’s Sweeping has added Diesel Smoke testing as one of their services. “Many of our customers are going to be shocked by the price increases caused by the air quality regulations,” says Mark. “It’s sad that the natural decrease in sweeping caused by higher prices will result in more air and water pollution. It already has. Not only will that sharing enable Bill’s Sweeping Service to shine, but also the entire industry.